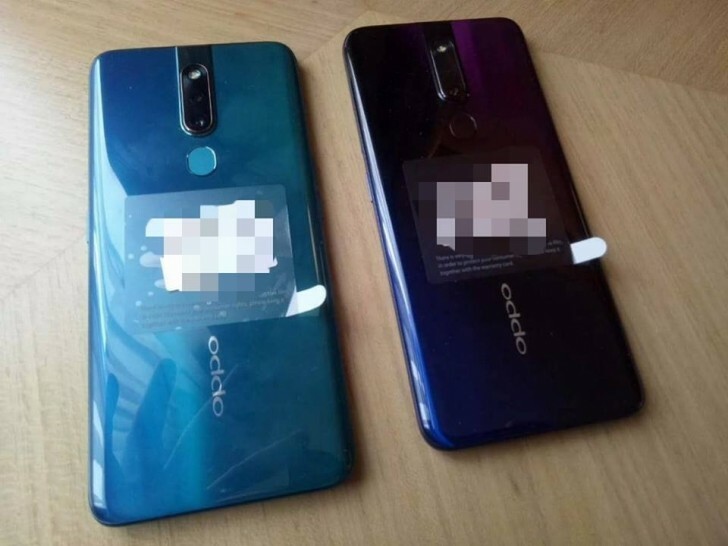 Oppo has been hitting the rumor mill rather hard lately with teaser after teaser of its upcoming Oppo F11 Pro phone. Add a few interspersed leaks to the mix and it's already pretty easy to get a general idea of what the company's latest "Selfie Expert" will bring to the table. Naturally, the main attraction being a 48MP main camera on the back and a motorized selfie unit on the front. Well, thanks to a fresh and rather extensive specs leak, we can now confirm the latter will be rocking a 16MP, 1/3.1" sensor, behind an f/2.0 lens. Unfortunately no word on the autofocus situation. On the back, the Oppo F11 Pro boats a 48MP, 1/2.25", f/1.79 camera (likely the Samsung ISOCELL GM1 or the Sony IMX586 sensor), plus a secondary 5MP, 1/5", f/2.4 one. Other revealed specs include full body measurements: 161.3 x 76.1 x 8.8 mm, a weight of 190 grams and two color options: Thunder Black and Aurora Green. That fairly hefty shell houses a big 6.5-inch TFT-LTPS display, with a resolution of 2340 x 1080 pixels. Powering it we have a MediaTek Helio P70 chipset along with 6GB of RAM and 64GB or 128GB of storage. A big 4,000 mAh battery pack is also part of the mix, complete with VOOC Flash Charge 3.0 support. You can check the picture for other particulars. Oppo has scheduled an event during WMC 2019 on Saturday, which will likely focus mostly on the company's intriguing 10x camera zoom module. We expected the F11 Pro to be a bit tardy and miss the Barcelona venue, but given these developments we might just see it make an official appearance. Not bad specs (Helio P70 is very underrated for real-life use). Considering it uses MediaTek, if the price is right, it's gonna do well.